The soft insert on the White Hot is made of the same material as the cover of Callaway''s Rule 35 golf ball, so it is very soft and responsive!!! 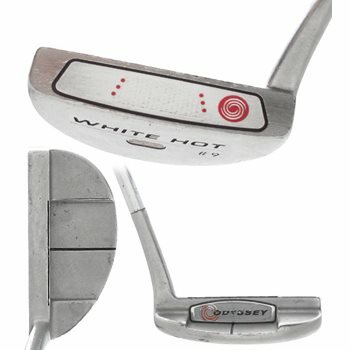 Get your WHITE HOT PUTTER TODAY!! The White Hot XG #9 is a toe-weighted, heel-shafted, flanged blade with a long hosel and half-shaft offset. This is the model used by Phil Mickelson to win the 2006 Masters. Elastomer Core Material - Soft for great feel, and highly resilient to get the ball rolling quickly. Thin, outer striking surface - Firm for fine-tuned responsiveness. Textured Impact Zone - Enhances feel and clearly defines the sweet spot.